Cowboys owner Jerry Jones issued what in essence is his "State of the Union" address on Tuesday and said he’ll guide the team in largely the same direction as in the recent past due to the fact Dallas has "been in it in the last three years" â "in it" meaning playoff contention to Week 17. 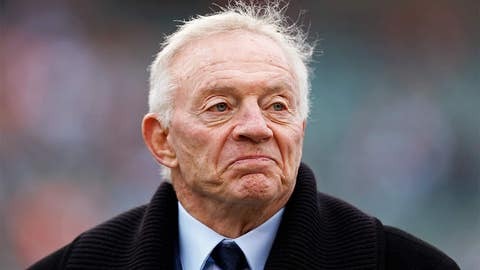 "We have been in it the last three years," Jones told 105.3 The Fan, answering a question about plans to have coach Jason Garrett return for the final year of his contract. "Of course, Jason has been on this staff going on seven years. We have been in it during his time as head coach. We have been in it right there, playing for (the NFC East title) in the last game the last three years. But, Jones added, "I’m in complete step with our fans that want more than 8-8." Jones declined to comment on the job status of coordinators Bill Callahan and Monte Kiffin, though we’ve reported both are on "shaky ground." Indeed, while Jones said there will be fewer changes on the staff than last year, and also said he’s in no hurry to finalize things, his unwillingness to commit to the coordinators seems to speak volumes. In a classic bit of Jerryese regarding their contracts, the owner said, "I think I think you’ve got to assume that their contract status is (their status) until we do differently. Those guys â¦ are still under contract. There are others that are under contract. There are others that are not. The real world is since I haven’t, we haven’t, addressed this thing is whatever their contract status is, and I don’t want to get into what that status is. But whatever it is, it is." The struggles of Kiffin’s defense are well-publicized; while Dallas nearly doubled its takeaways from the previous season under the dismissed Rob Ryan, Kiffin’s group finished last in the NFL in total defense and allowed 6,645 total yards — the third-most in NFL history. Callahan’s issues are less-recognized publicly. He was hired before the 2012 season as the offensive coordinator. This year, after an arduous offseason decision-making process, he took over play-calling duties from Garrett this year. But as the season went on, Garrett seemingly became more involved â ans answers about true responsibility because less transparent â¦ just as the owner is now being about his coordinators’ futures. Now, we had a rough year, but we didn’t necessarily have a rough year because of coaching in terms of our defense," Jones said. "So all of that will be considered as we look ahead." That look will continue to feature Garrett, who as reported earlier this week, might wish for a stronger voice in the hiring/firing of his top aides. In a more behind-the-scenes way, it will also feature Will McClay, the fast-rising Assistant Director of Player Personnel, who has the respect of both the ownership wing and the coaching wing. "All you have to do is win a couple more," said Jones about that leadership group having Dallas "in it." "We have won some games that were hard-fought to get those eight wins. So having said that, I think there is a positive to have the team right there in a position to win the East, fighting for it, certainly prepared. That was a bearing on my decision with Jason."